This two bedroom unit in Hamilton sold for $370,000. Nineteen of the 33 Auckland properties offered at Bayley's latest auctions were sold with 12 being passed in for sale by negotiation and two being postponed, giving a clearance rate of 58%. Down the line two of the three properties auctioned in Matamata found new owners and two of the six auctioned in Hamilton were sold. Highlights of the Auckland auctions included a character clifftop home on Burwood Crescent in Remuera that sold for $4.3 million, a bungalow in Western Springs that went for $1.1 million, a two bedroom ex-state house on the Mt Albert border that fetched $700,000 and a two bedroom house at Botany Downs that sold for $845,000. 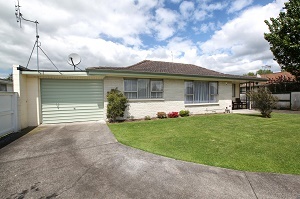 In Matamata a modern house marketed as a "great first home" sold for $420,000 and a three bedroom villa on a 7000 square metre lifestyle block sold for $620,000. In Hamilton a two bedroom unit went for $370,000 and a 358 square metre house in one of the city's top streets sold for $1,080,000. Check out the results of Bayleys latest auctions, with details and photos of the properties offered including those that didn't sell, on our Auction/Sales Results page. I know it is estate agent talk but I do think the top end market will keep going up. Leading real estate agent Graham Wall said interest in this country's high-end properties was intensifying. "We've had months of it already. I don't think it's all specifically Trump, of course, but it's part of the conversation," Wall said. New Zealand was attractive, he said, because it was the "safest place on earth". "The bottom line is we live in the only country in the world with a truly golden future," he said. "If you distil down all the things that all the wealthy Americans and English tell us it comes to this: New Zealand has security and supply of water and, even more importantly, we have security from unwanted immigration. New Zealand is the only country in the world that can choose its immigrants." Wall, who typically sells properties worth more than $5 million, said some homes didn't even need to be advertised. "We've got people waiting for them ... our problem is finding the properties," he said. "We've got people asking us to buy them properties and we're trying to convince New Zealanders to sell them because they all think they're going to be worth more next year and they're probably right." Yes, stake your claim in Elysium while you still can. I see a few of the high end sales exceeded the www.homes.co.nz high end estimate. This in Palmy just sold after being advertised for less than 1 week for 115k over GV ($410500 sale price, 295k GV). Very well presented, but otherwise not too special house in a highly popular part of milson close to schools, airport, hospital and shops.